Portuguese designer Susana Soares has developed a device for detecting cancer and other serious diseases using trained bees ( + slideshow). Bees have also been trained to detect explosives and a company called Insectinel is training “sniffer bees” to work in counter-terrorist operations. November 24, 2013 - Honey Bees Trained to Detect Cancer on Patients' Breath [VIDEO] MashableNew research suggests that honey bees can be trained to detect certain early-stage cancers in humans. November 12, 2013 - How honey bees may one day help detect signs of cancers The GuardianHoney bees have a powerful sense of smell and can be trained to detect symptoms of disease on human breath. July 20, 2018 - Bees Are Smart But Don't Try Training Them at Home HowStuffWorksEntomologists are training bees to do everything from sniff out bombs to detect cancer. HowStuffWorks talked to two to find out exactly how. February 7, 2019 - Not Only Can Honeybees Count, They Can Also Do Math - D-brief Discover MagazineResearchers found that honeybees can add and subtract after teaching them a system of color cues to use in their math tests. December 13, 2013 - Can Bees Be Trained to Sniff Out Cancer? 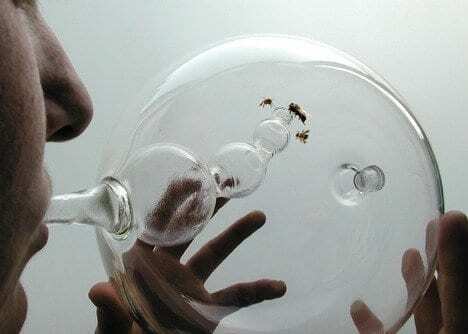 SmithsonianA British artist has designed Bee's, a glass diagnostic tool that aims to make screening as simple as breathing into a bowl.